You have to agree with us that one of the most exciting things about backpacking and camping, is enjoying a hearty meal, that you have cooked yourself, after a long day’s hike. Having the right backpacking frying pan to take with you can help you enjoy your outdoor experiences and add the joy of feeding yourself and your friends to the overall fun. 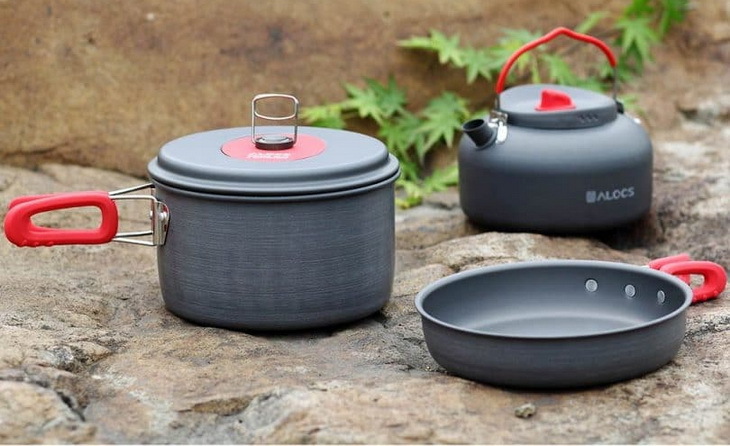 When you find yourself looking for the right pan for the plan, you will definitely need to look into which item of cooking ware will be best suited to you style of hiking. Long mountain trails will need a hefty, durable pan that offers plenty of carry options; for a spontaneous morning trip you will need a pan that fits into your daypack with ease. Depending on your needs, there are numerous great options available on the market for decent, camp proof frying pans. Here, we have compiled some great cookware to help you in selecting the equipment that would fit your needs. However, before we get to that, let’s look at some of the features that make an excellent frying pan. The first thing you will need to consider when looking to buy a frying pan is how you will be using it. As a backpacker, you will need a lightweight equipment made of different other features that make it a versatile cookware. A lightweight frying pan makes it possible for you to carry it around without having to worry about getting exhausted. The material used to make the pan is also essential for weight and heat dispersion. When choosing a frying pan, you should remember that some materials are better at retaining heat than others, spreading it throughout the pan. In addition to being lightweight, the hard anodized aluminum is lightweight and disperses heat evenly. As a result of this, you will be able to save on fuel. This is a great benefit for backpackers and those taking part in extended camping tours. While family, casual, or car campers may not be concerned about weight, hikers and backpacker will definitely consider this aspect. Titanium materials will provide the lightest products, so large backpacking parties should consider these for a lightweight addition to their packs. 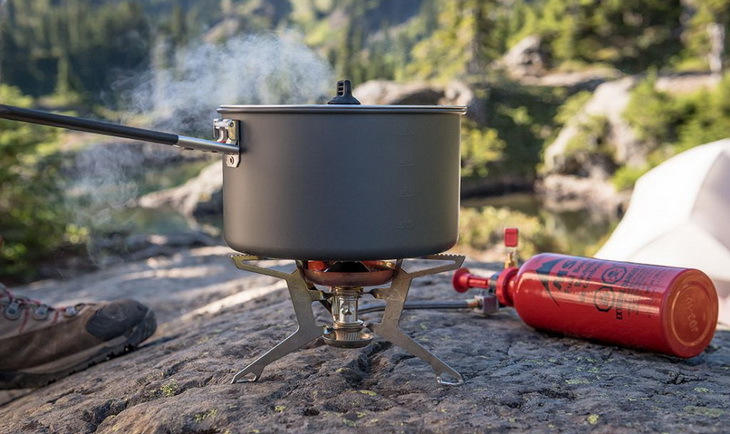 When considering long and stationary camping trips, durable cast iron cookware could be the right option to go with. It’s an excellent idea to use plastic cooking utensils or wood to avoid damaging or scratching your frying pan when cooking. Titanium is the lightest material you can use. The stainless steel material is not as light as titanium or anodized aluminum, but it’s durable and affordable. Another thing you will need to put into consideration is how efficient the pan is. Getting the best out of your cookware will help save time. Additionally, an effective pan is one that gets heated with ease, helping to save fuel in the long term. The efficiency of the frying pan is also dependent on its height and diameter, and color. 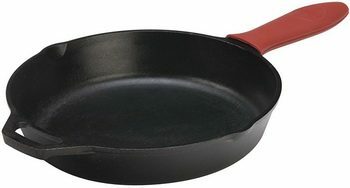 Pans with flat dark bottoms are known to be more fuel efficient.As older pans blacken with time, they become more effective compared to new and shiny pans. The wider diameter frying pans are more efficient compared to tall skinny ones as a larger surface area is exposed to hot gasses and flame thus transferring more heat through the system. Another concern is the durability of material used to make the pan. You should consider aspects of durability and scratch-resistance. In camping situations, cookware is often subject to scratches and dents, and for that reason, the cookware you choose should resist all these external aspects. The kit’s size is also an essential aspect when considering the number of people you will cooking for. When you’re taking part in a group camp, a larger and heavier set will do just fine. When considering your kit, you should always remember that burners and pans need to proportional. Additionally, these should be able to cook for the people you will be camping with. Having the black surface on your pan, will help in absorbing and distributing the heat faster compared to the non-blackened equipment. Therefore, either go for pans with blackened bottom or paint the sides and bottoms using flat-black paint to create this effect. Although most pans are designed with rounded edges, there are some that have sharp angles on their edges. 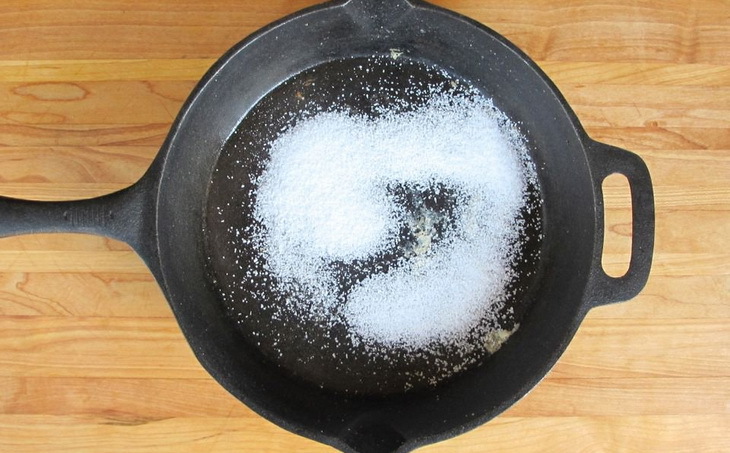 You’ll want to pick a rounded-edge pan as this will make it easier for you to clean it. Additionally, this will make it possible for the flames to lick up and if around the pan much more easily. This feature is important if you want to ensure your piece of cookware doesn’t consume much space in your pack. 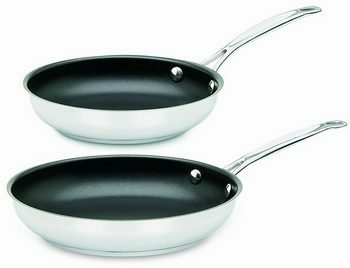 Some frying pans come with foldable or removable handles or grippers which are separate. Additionally, some equipment can be nested together making it easier for you to reduce the size of your cookware and minimize the amount of space the pans consume. If you will be utilizing a separate pot gripper handle, ensure that the top edge of your pan has a lip that easily connects to the handle. Without this feature, the handle will likely slip, and the frying pan will fall off. Now it’s time to see which frying pans are the finest the market has to offer, so that you can find the model that suits your needs perfectly. Description: The MSR Alpine is a part of a backpacking equipment that will make your outdoor cooking easier as it comes with features that make it suitable for use when you are out camping. This pan incorporates a heat-spreading aluminum disc on its bottom to provide an even heat that will ensure your meal cooks within the shortest time possible. It’s a compact cookware that comes with a foldable/removable handle. This frying pan is rugged and has a thick base to enhance the distribution of heat and discourage warping. The even distribution of heat is made for better cooking. As mentioned, the detachable handle offers convenience, but can rattle unless put in a cloth. 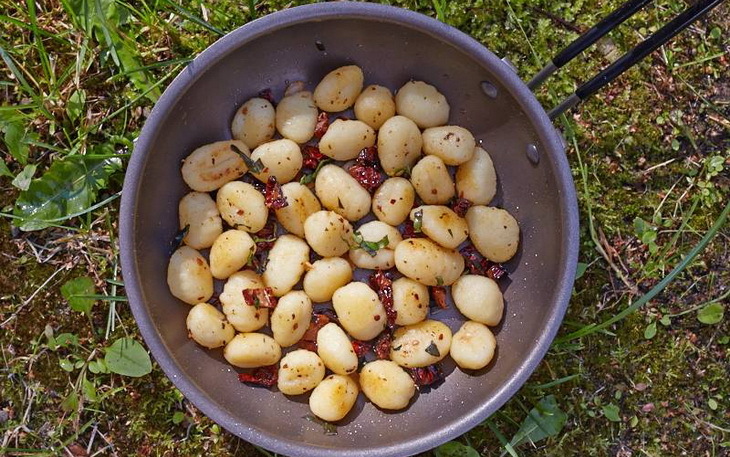 The MSR Alpine Fry Pan is lightweight enough for backpacking and is more efficient compared to the mess kit types that have thin bottoms which warp in heat. For this model, a tight-fitting lid would help enhance its efficiency. Related: Keeping all of your gear stowed away properly and secured is essential for all hikers, especially those wanting to cook a little as they go. Having a stow away pot with a fitted lid that clasps down easily on the lid, and being made of stainless steel, makes this MSR 321109-P Stowaway Pot purchase, a no-brainer. Description: Be prepared for just about any outdoor adventure with the T-Fal E93808 . This nonstick cookware comes with an innovative Thermo-spot heat indicator technology which ensures you pan is properly preheated – this is a must if you will be sealing in flavor and juices. When the patterns at the middle turn red, your pan is hot enough to start cooking. The heavy-gauge aluminum material offers fast, even heating, the warp-resistant bases make these pans compatible with any burner, including induction. Lead-, PFOA-, and cadmium-free, the pan’s ProMetal nonstick surface provides extraordinary strength and scratch resistance. Moreover, the surface interior requires little or no fat, allowing for effortless food release, healthy cooking, and quick clean up. The riveted silicone handles attached to the rounded edge to stay cool to the touch offering a comfortable and secure grip, and its tempered-glass lids fitted with cool-touch handles help trap the moisture and heat, making it easy for you to monitor the cooking. The shallow and wide T-Fal frying pan work perfectly for browning, frying, sautéing, searing, and more. It can be used to prepare anything from breakfast to dinner. The pan is dishwasher safe, and its oven is safe for use up to 4000 F. The T-Fal offers ultra-convenient and exceptional versatility for everyday use. Related: T-fal are not just giants of the frying pan industry, they have started to corner the accessories market too. Using the heat resilience technology that has made T-Fal a household name, married with the durability of its Nylon material, makes this T-fal Excite High-Temp Nylon Spatula a brilliant addition to your travel gear. Description: The Lodge L10SK3A is a multi-functional backpacking equipment that works wonders with all your favorite recipes and foods. There is so much you could do with this pan including frying a mess of catfish, bake an apple crisp, and roast chicken. This 12-inch pan comes with two handles that facilitate your heavy lifting and side lips for pouring. Cast iron is suitable for a campfire, an oven, or a stove top, and can slow-cook meals without scorching. This material retains heat, making it possible for you to sear the meat at higher temperatures, and keeps your meals warm for an extended period. 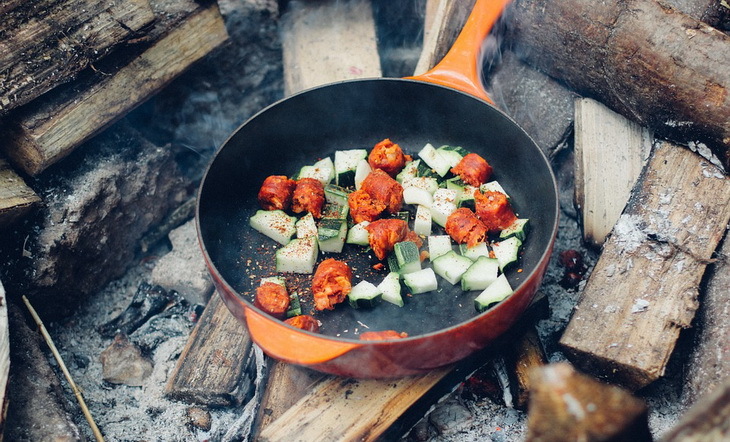 Whether used in camps or kitchens, the cast iron skillets are indestructible and can last for generations. Made of cast iron, it distributes heat from its bottom through its sidewalls. This product looks fantastic in most kitchens, and what’s more, the material can offer nutritional iron. Cast iron ranks as one of the best cooking materials and provides a nearly non-stick surface. If you are looking for performance and efficiency, the Lodge Cast Iron Skillet is certainly the right option to pick. Related: The old idea that ‘the less cleaning for a skillet, the better‘, as all of the flavors from the dish cooked before, add to the dish cooked next. Making the food richer with more robust flavoring. But, as you will be on the move a lot, cleaning all the food off of your cooking gear is a must, and the Lodge Lodge SCRBRSH Scrub Brush pairs perfectly with this skillet to help them achieve a thoroughly accomplished clean. 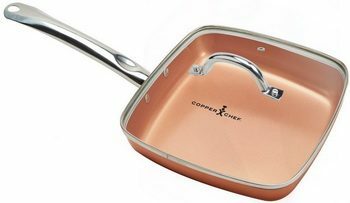 Description: The Copper Chef MIU0MM was designed using stainless steel induction, which makes for a proper cooking on any surface. Moreover, the steel induction allows for fast, even cooking, making your meals much tastier. From ceramic to electric, gas, to induction cook tops, you can choose any type of burner with the Copper Chef. Its Cerami-Tech, non-stick technology, is there to ensure that absolutely nothing gets stuck on the surface when you are cooking. Additionally, this feature makes it possible to clean up the equipment with much more ease. Furthermore, the pan allows you to cook without oil, butter, or chemicals, which is a huge health plus. Also worth mentioning is the fact that its riveted handles, allow you to safely use it even in high-heat conditions, and the frying pan is oven safe for temperatures up to 8000 F, but you have to be careful when taking it out. Related: As the Copper Chef is everything that you need in a pan, as is the GasOne GS-3800DF Gas Stove. It is compact enough to be easily carried around in your bag and can still pack a punch when it comes to bringing the flames to your cooking stove. Description: The DaTerra Cucina Vesuvio is a non-stick multi-layered heat-distribution pan that has a natural volcanic ceramic coating for an excellent and superior performance. The features incorporated in the Vesuvio PTFE- and PTOA-free frying pan makes it possible for you to take your cooking skills to a whole different level. The silicone handle-grip, along with the matching lid edging, allow for a cool-touch and safe handling and offers sufficient protection against wear and tear. An Italian original, the Da Terra Cucina Vesuvio transfers easily from one burner to another, helping you to perfect your gourmet steak, veggie, fish, pork roast, among other dishes. This cookware, also incorporates an ample 2.5-inch depth that makes it possible for you to poach or deep-fry with ease. Made from natural volcanic minerals, this cookware is safer than Teflon that contains harmful chemicals such as PTOA and PTFE, and will eventually scale off into your food. By contrast, the scratch-resistant surface of the Vesuvio makes it possible for you to cook healthy and safe meals and minimizes the need for additional oil. This innovative equipment also incorporates a triple-layer aluminum core for durable use, even heat distribution, and lightweight maneuvering. The oven is safe for use in temperatures of up to 490o F. Other features of this cookware include; High-heating without warping, Scratch-resistant ceramic coating, long silicone grip handle, and a generous 2.5-inch depth. The non-porous, ceramic surface makes it possible for you to easily hand-wash your skillet, keeping its appearance fresh for years. Nonetheless, if you don’t mind, you can run the pan through a dishwasher. Since it features a maintenance-free design, the pan doesn’t require periodic oiling or special cleaning. 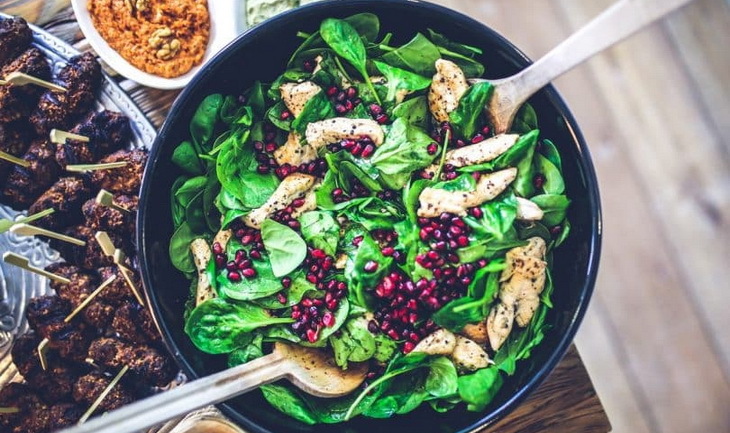 This makes it possible for you to shift your focus on what matters – preparing delicious meals. Related: Unlike other food containers that we have recommended in this article, the Simple Modern W0E5W Food Jar will keep what needs to be kept hot, hot. Which is perfect for snack and stops as you continue on your hikes. Description: The Cuisinart Chef’s Classic Skillet Set is an excellent addition to your backpacking equipment. This frying pan is designed to surpass the expectations of gourmet chefs, as ti features a stainless steel exterior that has been polished to an excellent mirror finish. Its top quality construction makes it a truly premium product. Furthermore, it features a solid aluminum encapsulated in its base, which provides unsurpassed heat distribution, thus better cooked and tastier food. The advance Quantanium non-stick surface is durable and offers optimum food release. Also, its base maintains an even distribution of heat, getting rid of hot spots for consistent performance. The Cuisinart Nonstick is a fusion of the best materials that enable healthy cooking and stress-free, fast cleanup process. The nine- and eleven-inch skillets, feature wide, flat bottoms and sloped sides to maximize efficiency and make it simpler to rearrange food while you are preparing your meal after a long day in the outdoors. Related: Though the CuisinArt has a cool grip handle, offering up a large meal to your friends in the hiking group can make for a tricky offering up of what is available on the pan. Having an extra purchase on the pan can help dish out what’s been cooking. Therefore, we can recommend the Cuisinart Silicone Potholder. Description: The Forfar Outdoor is lightweight and easy to carry, making it an ideal cookware for your camping and backpacking tour. It’s always a convenient option to carry around every time you are out hiking. Apart from that, this frying pan is constructed from a high-quality aluminum material that makes it light enough to carry around. It offers an excellent gourmet performance, is easy to use, and easy to clean. As a result, using the Forfar pan makes it possible for you to save paper and water. Its foldable handle makes it easier to pack and carry. 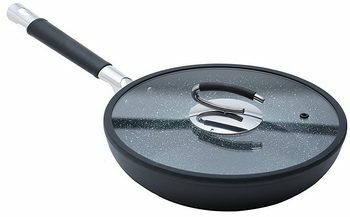 This frying pan is coated with classic two coat system to enhance durability. Its non-stick surface enables you to use less oil, saving on cost in the long-run. Related: Rather than discard all of your left over food, or storing it in your stowaway pot with all of the cooking materials you are carrying, it is a lot wiser to carry with you extremely durable and handy, Forfar GDVQANU Cookware. Easy to pack and strong enough for any journey. There are numerous types of camping and backpacking cookware equipment on the market, that vary in their price margin. Car camping, backpacking, and backyard cooking are just some that you have to rifle through in order to find what you are looking for. It is a mind boggling amount of choice that is hard to mull over eggs. 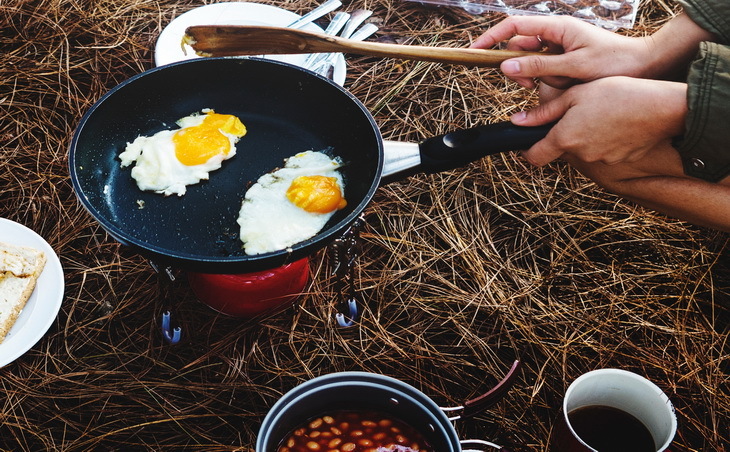 So now that we have offered a concise list of the best frying pans on the market for each average type of camper, we hope that the choices have been made easier to make, and that your next trip is accompanied by a meal cooked for and by the occasion. So, which of the options given above do you already own? Let us know by posting in our comment section. Pins and shares will be highly appreciated.